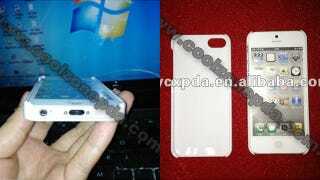 A Chinese case manufacturer is showing what looks to be an iPhone 5 in their product shots. It looks like the white 3D prototype we published a while back—complete with its new 19-pin dock port. But could this really be a unit smuggled out of Foxconn's factory? Back in May 12, 2010—some weeks after Gizmodo published exclusive video and images of an iPhone 4 lost in a beer house—another iPhone 4 appeared in video and photos on a Vietnamese site. Apparently, it had been smuggled from the factory. The same happened soon after with the iPod touch. This took place about a month and a half in advance of the iPhone 4 commercial release, on June 24, 2010. To be sure, Foxconn was already manufacturing the new phones en masse at its Shenzhen factory around the time this video was published. Perhaps even as far back as April, when we published our own story. Could this mean that Foxconn may already be producing the iPhone 5 in anticipation of its rumored October launch? It may seem a little bit too early, perhaps. But we have seen a lot of its parts in the wild already. And July is almost over, and that would leave a little more than two months to produce and distribute millions of units to be sold all round the world on the first day of release. Consider, too, that iPhone 4S sales were far lower than expected these last three months. The reason? iPhone 5 rumors were already scaring people away. It was clearly a sore point during Apple's earnings call this week, and gives the company every reason to get its new handset in the hands of customers as soon as possible. It wouldn't be at all surprising if instead of eating another 2-3 months of lackluster sales, Apple just moved up the iPhone 5's release date. Which means production would have already started. On the other hand, this may be just a custom-made test prototype based on the rumored specifications and leaked parts. Maybe that's why they are not showing it up close and not making a big deal out of it. The iPhone shows iOS running with a weird combination of icons, including the old Maps icon. That's strange. The iPhone that appeared in Vietnam wasn't running any version of iOS, but the test OS. The images—which someone tried to sell us even though they are publicly available at the case manufacturer's web site—certainly look real. However, we can't be certain that this iPhone is indeed the real McCoy.